ca. 418 B.C.E. – 362 B.C.E. Epaminondas (Greek: Ἐπαμεινώνδας) (ca. 418 B.C.E.–362 B.C.E.) was a Theban general and statesman of the fourth century B.C.E. who transformed the Ancient Greek city-state of Thebes, leading it out of Spartan subjugation into a preeminent position in Greek politics. In the process he broke Spartan military power with his victory at Leuctra and liberated the Messenian helots, a group of Peloponnesian Greeks who had been enslaved under Spartan rule for some 200 years. Epaminondas reshaped the political map of Greece, fragmented old alliances, created new ones, and supervised the construction of entire cities. He was militarily influential as well, inventing and implementing several major battlefield tactics. The Roman orator Cicero called him "the first man of Greece," but Epaminondas has fallen into relative obscurity in modern times. The changes Epaminondas wrought on the Greek political order did not long outlive him, as the cycle of shifting hegemonies and alliances continued unabated. A mere 27 years after his death, a recalcitrant Thebes was obliterated by Alexander the Great. Thus Epaminondas—who had been praised in his time as an idealist and liberator—is today largely remembered for a decade (371 B.C.E. to 362 B.C.E.) of campaigning that sapped the strength of the great land powers of Greece and paved the way for the Macedonian conquest. Although Epaminondas was a historically significant figure of his time there is comparatively little information about his life available to modern scholars, and no one ancient historian gives a complete picture. Some of the notable biographies include works by Roman historian and biographer Cornelius Nepos (c. 100-24 B.C.E. ), Pausanias, Plutarch (40 - 120 C.E. ), Diodorus Siculus (90 - 21 B.C.E.) and Xenophon; not all of their works have survived to the present day. Cornelius Nepos's biography of Epaminondas was short, and a few more scraps of information can be found in Pausanias's Description of Greece. Plutarch wrote a biography, but it has been lost; however, some details of Epaminondas' life and works may be found in Plutarch's Lives of Pelopidas and Agesilaus. Within the narrative histories of the time, Diodorus Siculus preserves a few details, while Xenophon, who idolized Sparta and its king Agesilaus, avoids mentioning Epaminondas wherever possible and does not even note his presence at the Battle of Leuctra. Both narrative historians do provide details about the historical events of Epaminondas' time. Furthermore, not all of the ancient sources that deal directly with his life are considered entirely reliable. These issues may have contributed to a modern situation in which Epaminondas is virtually unknown, particularly in comparison to near-contemporaries like the Macedonian conqueror Alexander the Great and the Athenian general Alcibiades. Epaminondas' father Polymnis was an impoverished scion of an old Theban noble family. Nonetheless, Epaminondas received an excellent education; his musical teachers were among the best in their disciplines, as was his dance instructor. Most notably, his philosophy instructor Lysis of Tarentum (who had come to live with Polymnis in his exile) was one of the last major Pythagorean philosophers. Epaminondas was devoted to Lysis and was noted for his excellence in philosophical studies. Not merely an academic, Epaminondas was noted for his physical prowess, and in his youth he devoted much time to strengthening and preparing himself for combat. In 385 B.C.E., in a skirmish near the city of Mantinea, Epaminondas, at great risk to his own life, saved the life of his future colleague Pelopidas, an act thought to have cemented the life-long friendship between the two. Throughout his career he would continue to be noted for his tactical skill and his marked capacity for hand-to-hand combat. Epaminondas never married and as such was subject to criticism from countrymen who believed he was duty-bound to provide the country with the benefit of sons as great as himself. In response, Epaminondas said that his victory at Leuctra was a daughter destined to live forever. He is known, however, to have had several young male lovers, a standard pedagogic practice in ancient Greece, and one for which Thebes in particular was famous; Plutarch records that the Theban lawgivers instituted the practice "to temper the manners and characters of the youth." An anecdote told by Roman biographer and historian Cornelius Nepos indicates that Epaminondas was intimate with a young man by the name of Micythus. Plutarch also mentions two of his beloveds (eromenoi): Asopichus, who fought together with him at the battle of Leuctra, where he greatly distinguished himself; and Caphisodorus, who fell with Epaminondas at Mantineia and was buried by his side. Epaminondas lived his entire life in near-poverty, refusing to enrich himself by taking advantage of his political power. Cornelius Nepos notes his incorruptibility, describing his rejection of a Persian ambassador who came to him with a bribe. In the tradition of the Pythagoreans, he gave freely to his friends and encouraged them to do likewise with each other. These aspects of his character contributed greatly to his renown after his death. Epaminondas lived at a particularly turbulent point in Greek and Theban history. Following the end of the Peloponnesian War in 404 B.C.E., Sparta had embarked upon an aggressively unilateralist policy towards the rest of Greece and quickly alienated many of its former allies. 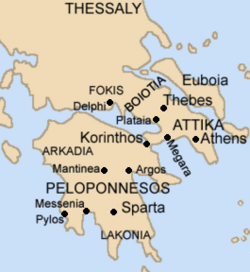 Thebes, meanwhile, had greatly increased its own power during the war and sought to gain control of the other cities of Boeotia (the region of ancient Greece northwest of Attica). This policy, along with other disputes, brought Thebes into conflict with Sparta. By 395 B.C.E., Thebes, alongside Athens, Corinth, and Argos, found itself arrayed against Sparta (a former ally) in the Corinthian War. That war, which dragged on inconclusively for eight years, saw several bloody Theban defeats at Spartan hands. By the time of its conclusion, Thebes had been forced to check its expansionist ambitions and return to its old alliance with Sparta. In 382 B.C.E., however, the Spartan commander Phoebidas made a strategic error that would soon turn Thebes against Sparta for good and pave the way for Epaminondas' rise to power. Passing through Boeotia on campaign, Phoebidas took advantage of civil strife within Thebes to secure entrance to the city for his troops. Once inside, he seized the Cadmea (the Theban acropolis), and forced the anti-Spartan party to flee the city. Epaminondas, although associated with that faction, was allowed to remain; he was believed to be nothing more than a harmless, impoverished philosopher. In the years following the Spartan takeover, the Thebans exiled by the new government regrouped at Athens and prepared, with the covert support of the Athenians, to retake their city. They communicated with Epaminondas, who began preparing young men inside Thebes for a coup attempt. In 379 B.C.E., a small group of exiles, led by Pelopidas, infiltrated the city and assassinated the leaders of the pro-Spartan government. Epaminondas and Gorgidas led a group of young men who broke into armories, took weapons, and surrounded the Spartans on the Cadmea, assisted by a force of Athenian hoplites (heavy infantry). In the Theban assembly the next day, Epaminondas and Gorgidas brought Pelopidas and his men before the audience and exhorted the Thebans to fight for their freedom. The assembly responded by acclaiming Pelopidas and his men as liberators. Fearing for their lives, the Spartan garrison surrendered and were evacuated. The Thebans of the pro-Spartan party were also allowed to surrender; they were subsequently killed by the victorious insurgents. When news of the uprising at Thebes reached Sparta, an army under Agesilaus was dispatched to subdue the restive city. The Thebans refused to meet the Spartan army in the field, instead occupying a stronghold outside the city; the Spartans ravaged the countryside but nonetheless departed, leaving Thebes independent. In short order the Thebans were able to reconstitute their old Boeotian confederacy in a new, democratic form. The cities of Boeotia united as a federation with an executive body composed of seven generals, or Boeotarchs, elected from seven districts throughout Boeotia. This political fusion was so successful that henceforth the names Theban and Boeotian were used interchangeably in a nod to the newfound solidarity of the region. Seeking to squelch this new state, the Spartans invaded three times over the next seven years. At first fearing a head-to-head battle, the Boeotians eventually gained enough confidence to take the field and were able to fight the Spartans to a standstill. The advantage was furthered when, in 375 B.C.E., an outnumbered force of Boeotians under Pelopidas cut their way through the heart of a Spartan phalanx during the Battle of Tegyra. Although Sparta remained the supreme land power in Greece, the Boeotians had demonstrated that they, too, were a martial threat and a politically cohesive power. At the same time, Pelopidas, an advocate of an aggressive policy against Sparta, had established himself as a major political leader in Thebes. In years to come, he would collaborate extensively with Epaminondas in designing Boeotian foreign policy. No source states exactly when Epaminondas was first elected a Boeotarch, but by 371 B.C.E. he was in office; the following year, he led the Boeotian delegation to a peace conference held at Sparta. A feeble attempt at a Common Peace had been made in 375 B.C.E., but desultory fighting between Athens and Sparta had resumed by 373 B.C.E. (at the latest). Thebes, meanwhile, was strengthening its confederation. By 371 B.C.E., Athens and Sparta were again war-weary, so a conference was called. There, Epaminondas caused a drastic break with Sparta when he insisted on signing not for the Thebans alone, but for all the Boeotians. Agesilaus refused to allow this, insisting that the cities of Boeotia should be independent; Epaminondas countered that if this were to be the case, the cities of Laconia should be as well. Irate, Agesilaus struck the Thebans from the document. The delegation returned to Thebes, and both sides mobilized for war. Top: Traditional hoplite order of battle and advance. Bottom: Epaminondas's strategy at Leuctra. The strong left wing advanced while the weak right wing retreated. The red blocks show the placement of the elite troops within each phalanx. Immediately following the failure of the peace talks, orders were sent out from Sparta to the Spartan king Cleombrotus, who was at the head of an army in the pastoral district of Phocis, commanding him to march directly to Boeotia. Skirting north to avoid mountain passes where the Boeotians were prepared to ambush him, Cleombrotus entered Boeotian territory from an unexpected direction and quickly seized a fort and captured several triremes. Marching towards Thebes, he camped at Leuctra, in the territory of Thespiae. Here, the Boeotian army came to meet him. The Spartan army contained some 10,000 hoplites, 700 of whom were the elite warriors known as Spartiates. The Boeotians opposite them numbered only 6,000, bolstered by a cavalry superior to that of the Peloponnesians. In arranging his troops before the battle, Epaminondas utilized an as yet unheard of strategy in Greek warfare. Traditionally, a phalanx lined up for battle with the elite troops on the right flank—the "flank of honor." 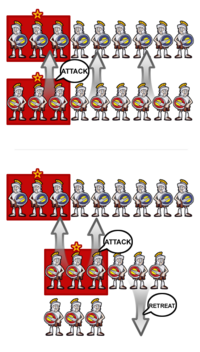 Thus, in the Spartan phalanx, Cleombrotus and his Spartiates were on the right, while the less experienced Peloponnesian allies were on the left. Needing to counter the Spartans' numerical advantage, Epaminondas implemented two tactical innovations. First, he and his Thebans lined up on the left, with the elite Sacred Band under Pelopidas on the extreme left flank. Second, recognizing that he could not extend his troops to match the width of the Peloponnesian phalanx without unacceptably thinning his line, he abandoned all attempt to match the Spartans in width. Instead, he deepened his phalanx on the left, making it fifty ranks deep instead of the conventional eight to twelve. When battle was joined, the strengthened flank was to march forward to attack at double speed, while the weaker flank was to retreat and delay combat. The tactic of the deep phalanx had been anticipated by Pagondas, another Theban general, who used a 25 man deep formation at the battle of Delium, but the staggered line of attack was an innovation. Thus, Epaminondas had invented the military tactic of refusing one's flank. The fighting opened with a cavalry encounter, in which the Thebans were victorious. The Spartan cavalry was driven back into the ranks of the phalanx, disrupting the order of the infantry. Seizing the advantage, the Boeotians pressed the attack. Cleombrotus was killed, and although the Spartans held on for long enough to rescue his body, their line was soon broken by the sheer force of the Theban assault. At a critical juncture, Pelopidas led the Sacred Band in an all-out assault, and the Spartans were soon forced to flee. The Peloponnesian allies, seeing the Spartans put to flight, also broke and ran, and the entire army retreated in disarray. Four thousand Peloponnesians were killed, while the Boeotians lost only 300 men. Most importantly, 400 of the 700 Spartiates on the scene were killed, a catastrophic loss that posed a serious threat to Sparta's future war-making abilities. For about a year after the victory at Leuctra, Epaminondas occupied himself with consolidating the Boeotian confederacy, compelling the previously Spartan-aligned polis of Orchomenos to join the league. In late 370 B.C.E., however, as the Spartans under Agesilaus attempted to discipline their newly restive ally Mantinea, Epaminondas decided to capitalize on his victory by invading the Peloponnese and shattering Sparta's power once and for all. Forcing his way past the fortifications on the isthmus of Corinth, he marched southward toward Sparta, with contingents from Sparta's erstwhile allies flocking to him along the way. In Arcadia he drove off the Spartan army threatening Mantinea, then supervised the founding of the new city of Megalopolis and the formation of an Arcadian League, modeled on the Boeotian confederacy. Moving south, he crossed the Evrotas River—the frontier of Sparta—which no hostile army had breached in historical memory. The Spartans, unwilling to engage the massive army in battle, lingered inside their city while the Thebans and their allies ravaged Laconia. Epaminondas briefly returned to Arcadia, then marched south again, this time to Messenia, a territory which the Spartans had conquered some 200 years before. There, Epaminondas rebuilt the ancient city of Messene on Mount Ithome, with fortifications that were among the strongest in Greece. He then issued a call to Messenian exiles all over Greece to return and rebuild their homeland. The loss of Messenia was particularly damaging to the Spartans, since the territory comprised one-third of Sparta's territory and contained half of their helot population. 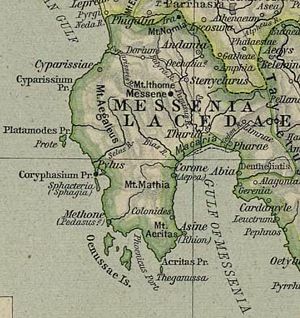 Messenia in the classical period. In mere months, Epaminondas had created two new enemy states that opposed Sparta, shaken the foundations of Sparta's economy, and all but devastated Sparta's prestige. This accomplished, he led his army back home, victorious. The jury broke into laughter, the charges were dropped, and Epaminondas was reelected as Boeotarch for the next year. In 369 B.C.E., Epaminondas again invaded the Peloponnese, but this time achieved little beyond winning Sicyon over to an alliance with Thebes. When he returned to Thebes, he was again put on trial, and again acquitted. Despite his achievements, he was out of office the next year, the only time from the battle of Leuctra until his death that this was the case. In this year, he served as a common soldier while the army marched into Thessaly to rescue Pelopidas, who had been imprisoned by Alexander of Pherae while serving as an ambassador. The commanders who led this expedition were outmaneuvered and forced to retreat to save their army. Back in Thebes, Epaminondas was reinstated in command and led the army straight back into Thessaly, where he outmaneuvered the Thessalians and secured the release of Pelopidas without a fight. In 366 B.C.E., a common peace was drawn up in a conference at Thebes, but negotiations could not resolve the hostility between Thebes and other states that resented its influence. The peace was never fully accepted, and fighting soon resumed. In the spring of that year, Epaminondas returned to the Peloponnese for a third time, seeking on this occasion to secure the allegiance of the states of Achaea. Although no army dared to challenge him in the field, the democratic governments he established there were short-lived, as pro-Spartan aristocrats soon returned to the cities, reestablished the oligarchies, and bound their cities ever more closely to Sparta. Throughout the decade after the Battle of Leuctra, numerous former allies of Thebes defected to the Spartan alliance or even to alliances with other hostile states. As early as 371 B.C.E., the Athenian assembly had reacted to the news of Leuctra with stony silence. Thessalian Pherae, a reliable ally during the 370s, similarly turned against its newly dominant ally in the years after that battle. By the middle of the next decade, even some Arcadians (whose league Epaminondas had established in 369 B.C.E.) had turned against him. Only the Messenians remained firmly loyal. Boeotian armies campaigned across Greece as opponents rose up on all sides; in 364 B.C.E. Epaminondas even led his state in a challenge to Athens at sea. In that same year, Pelopidas was killed while campaigning against Alexander in Thessaly. His loss deprived Epaminondas of his greatest Theban political ally. 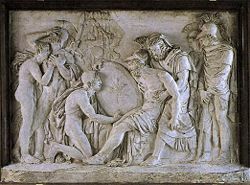 A relief of the death of Epaminondas, by David d'Angers. In the face of this increasing opposition to Theban dominance, Epaminondas launched his final expedition into the Peloponnese in 362 B.C.E. The immediate goal of the expedition was to subdue Mantinea, which had been opposing Theban influence in the region. As he approached Mantinea, however, Epaminondas received word that so many Spartans had been sent to defend Mantinea that Sparta itself was almost undefended. Seeing an opportunity, Epaminondas marched his army towards Laconia at top speed. The Spartan king Archidamus was alerted to this move by a runner, however, and Epaminondas arrived to find the city well-defended. Hoping that his adversaries had denuded the defenses of Mantinea in their haste to protect Sparta, he countermarched back to his base at Tegea and dispatched his cavalry to Mantinea, but a clash outside the walls with Athenian cavalry foiled this strategy as well. Realizing that a hoplite battle would be necessary if he wanted to preserve Theban influence in the Peloponnese, Epaminondas prepared his army for combat. What followed on the plain in front of Mantinea was the largest hoplite battle in Greek history. Nearly every state participated on one side or the other. With the Boeotians stood a number of allies: the Tegeans, Megalopolitans, and Argives chief among them. On the side of the Mantineans and Spartans stood the Athenians, Eleans, and numerous others. The infantries of both armies were 20,000 to 30,000 strong. As at Leuctra, Epaminondas drew up the Thebans on the left, opposite the Spartans and Mantineans with the allies on the right. On the wings he placed strong forces of cavalry strengthened by infantry. Thus, he hoped to win a quick victory in the cavalry engagements and begin a rout of the enemy phalanx. The battle unfolded as Epaminondas had planned. The stronger forces on the wings drove back the Athenian and Mantinean cavalry opposite them and began to attack the flanks of the enemy phalanx. In the hoplite battle, the issue briefly hung in the balance, but then the Thebans on the left broke through against the Spartans, and the entire enemy phalanx was put to flight. It seemed that another decisive Theban victory on the model of Leuctra was about to unfold until, as the victorious Thebans set off in pursuit of their fleeing opponents, Epaminondas was mortally wounded. He died shortly thereafter. With his dying words, Epaminondas is said to have advised the Thebans to make peace, as there was no one left to lead them. After the battle a common peace was arranged on the basis of the status quo. Isaak Walraven. 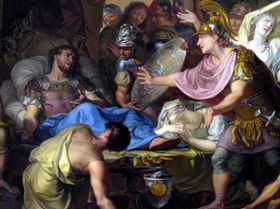 The death bed of Epaminondas. Rijksmuseum, Amsterdam. Extant biographies of Epaminondas universally describe him as one of the most talented men produced by the Greek city-states in their final 150 years of independence. In military affairs he stands above every other tactician in Greek history, with the possible exception of Philip of Macedon, although modern historians have questioned his larger strategic vision. His innovative strategy at Leuctra allowed him to defeat the vaunted Spartan phalanx with a smaller force, and his novel decision to refuse his right flank was the first recorded successful use of a battlefield tactic of this sort. Many of the tactical changes that Epaminondas implemented would also be used by Philip of Macedon, who in his youth spent time as a hostage in Thebes and may have learned directly from Epaminondas himself. Victor Davis Hanson has suggested that Epaminondas's early philosophical training may have contributed to his abilities as a general. In matters of character, Epaminondas was above reproach in the eyes of the ancient historians who recorded his deeds. Contemporaries praised him for disdaining material wealth, sharing what he had with his friends, and refusing bribes. One of the last heirs of the Pythagorean tradition, he appears to have lived a simple and ascetic lifestyle even when his leadership had raised him to a position at the head of all Greece. In some ways Epaminondas dramatically altered the face of Greece during the 10 years in which he was the central figure of Greek politics. By the time of his death, Sparta had been humbled, Messenia freed, and the Peloponnese completely reorganized. In another respect, however, he left behind a Greece no different than that which he had found; the bitter divides and animosities that had poisoned international relations in Greece for over a century remained as deep as or deeper than they had been before Leuctra. The brutal internecine warfare that had characterized the years from 432 B.C.E. onwards continued unabated until the rise of Macedon ended it forever. At Mantinea, Thebes had faced down the combined forces of the greatest states of Greece, but the victory brought it no spoils. With Epaminondas removed from the scene, the Thebans returned to their more traditional defensive policy, and within a few years, Athens had replaced them at the pinnacle of the Greek political system. No Greek state ever again reduced Boeotia to the subjection it had known during the Spartan hegemony, but Theban influence faded quickly in the rest of Greece. Finally, at Chaeronea in 338 B.C.E., the combined forces of Thebes and Athens, driven into each others' arms for a desperate last stand against Philip of Macedon, were crushingly defeated, and Theban independence was put to an end. Three years later, heartened by a false rumor that Alexander the Great had been assassinated, the Thebans revolted; Alexander squashed the revolt, then destroyed the city, slaughtering or enslaving all its citizens. A mere 27 years after the death of the man who had made it preeminent throughout Greece, Thebes was wiped from the face of the Earth, its 1,000-year history ended in the space of a few days. Epaminondas's actions were certainly welcomed by the Messenians and others whom he assisted in his campaigns against the Spartans. Those same Spartans, however, had been at the center of resistance to the Persian invasions of the 5th century B.C.E., and their absence was sorely felt at Chaeronea; the endless warfare in which Epaminondas played a central role weakened the cities of Greece until they could no longer hold their own against their neighbors to the north. As Epaminondas campaigned to secure freedom for the Boeotians and others throughout Greece, he brought closer the day when all of Greece would be subjugated by an invader. Victor Davis Hanson has suggested that Epaminondas may have planned for a united Greece composed of regional democratic federations, but even if this assertion is correct, no such plan was ever implemented. For all his noble qualities, Epaminondas was unable to transcend the Greek city-state system, with its endemic rivalry and warfare, and thus left Greece more war-ravaged but no less divided than he found it. ↑ Plutarch, Life of Pelopidas, Translated by John Dryden. Classics MIT. Retrieved May 5, 2008. ↑ Atheneus, Deipnosophists, Book III 605–606.Fordham University. Retrieved May 5, 2008. ↑ Plutarch, Life of Pelopidas. ↑ For these events and the description of the battle itself, see Diodorus, Library 15.52–56, Xenophon, Hellenica 6.4.4–20, and Plutarch, Life of Pelopidas. For a synthesis, see Fine, The Ancient Greeks. ↑ For the invasion and liberation of Messene, see Diodorus, Library; Xenophon, Hellenica; and Plutarch, Life of Pelopidas. For a synthesis, see Fine, The Ancient Greeks. ↑ Plutarch. Life of Pelopidas. ↑ For these this campaign and the battle of Mantinea, see Diodorus, Library 15.82–89, Xenophon, Hellenica 7.5.9–27, and Plutarch, Life of Agesilaus. For a synthesis, see Fine, The Ancient Greeks. Lazenby, James F. "Epaminondas," from The Oxford Classical Dictionary, Hornblower, Simon, and Antony Spawforth ed. Nepos, Cornelius (c. 100-24 B.C.E.) Lives of Eminent Commanders, Translated by the Rev. John Selby Watson, MA. (1886), 305-450. online Lives From ccel.org. Christian Classics Ethereal Library. Retrieved November 24, 2007. Plutarch. Parallel Lives From MIT. Retrieved November 24, 2007. 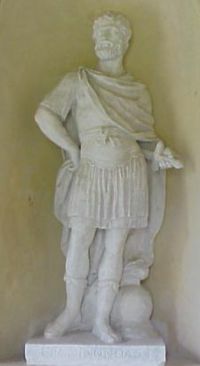 Xenophon. Hellenica translated by Henry Graham Dakyns, online . Project Gutenberg.org. Retrieved May 5, 2008.